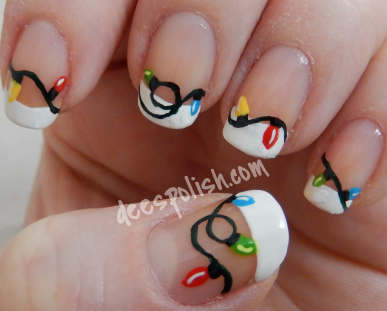 I am sure most are super familiar with the Christmas lights nails.. if not.. take a quick mo here and google it, I shall wait. Right? Seen them many a-times, correct? Well.. I figured why not do them? To my recollection, I have never actually done these nails. I also figured that despite my best planning efforts, my last look, the one for today, and the one for tomorrow all started with a white base. So. For this one, I did the 'french tip' version. I like it. Simple, yet fun! That is all for today -- sorry for the brief post. I am getting this all done rather late, and my alarm is set to go off rather early. Ohh life!